I’m a fan of non-revenue equipment and have acquired a few pieces for my layout. For example, I’ve built a CNR wooden snow plough from a much-modified, vintage Ambroid craftsman kit, and kit bashed a (static) model of an MoW gang’s speeder. I’ve painted and finished a Burro crane, including DCC, and painted and finished a scale test car. These are all fine examples of non-revenue equipment, but none of them is as versatile as a Jordan Spreader. Sadly, nobody makes one in 1:64 – the Model A Jordan Spreader pictured above is an HO scale model imported by Overland. I’ve actually been collecting data and photos of the Model A Jordan Spreader since seeing photos of one in an article in Issue 60 of CN Lines, the magazine published by the Canadian National Railways Historical Association. The article features the HO scale models of CNR non-revenue equipment built by the late Ron Keith and included both prototype and model photos of a Model A Jordan Spreader in CNR livery. (Coincidentally, this was the same issue in which I introduced my layout to the magazine’s readers.) When I saw that tiny, cab-less Spreader, I knew I’d have to build one. I’m not yet ready to start this project because scratch-building any piece of equipment is a huge undertaking and I have other, more pressing things on my to-do list right now. But the lack of a good reference from which to work was a major stumbling block to getting started – and now that I have one, that barrier has been removed. Between the model, the data, and the photos I’ve collected, I’m confident I can proceed. And when I’m finished the S scale model, I can either sell off the HO version (it won’t be harmed in its role as a study model), or paint it up for the CNR and display it on a shelf. This entry was posted in equipment, Jordan Spreader, Non-Revenue by Trevor. Bookmark the permalink. That is going to be one heck of a great model one day. I have long been enamored of MOW equipment and especially Spreaders. Here in Washington state there are a couple of excellent examples of the large variety spreaders, but I have not found a small one like yours. The spidery appearance makes it especially attractive. I hope you get to this soon. I look forward to watching the build! As a fellow aficionado for non-revenue freight I have a spreader waiting to be built (I’m not sure what version it is, the one Walthers released as a plastic kit). I’ll be kit bashing it (or at least trying to) into one of the DM&IR’s spreaders someday. … and one of a CNR spreader of the same vintage, but with a wooden cab. Rio Grande Models make cast parts for an Sn3 Jordan Spreader that might be useful for both parts and plans. PBL also offered a brass model in Sn3 some time ago. Great project – one of the most complex pieces of rolling stock ever. Interesting example here, too, liking the truck guards on the “front” truck, to protect from un-spreaded gravel, I suppose. “One of the most complex pieces of rolling stock ever”. I’ve seen examples with hatches over the truck guards to access the journals, too. And it appears the model rides on arch-bar trucks – or something similar – so that’s what I’ll use (because somebody made some in S scale once upon a time, and I have some in my stash). One step at a time, easy does it! Sounds like you’re doing it mostly in brass? I do like the cab on the one in the link above, especially in black, surprisingly elegant with the proper door and doorknob! 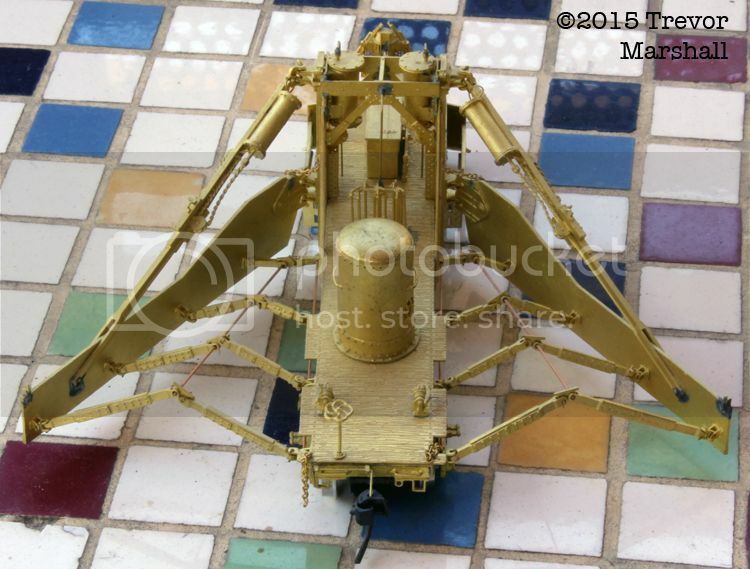 Trevor: PBL ( the Sn3 folks ) fairly recently produced 3 flavours of Jordan Spreaders in brass….gorgeous models. Go to the PBL website for more info. If you elect to go the scratch-building route, I can help with some photos and a drawing or three. I assume the PBL models (shown here) were all narrow gauge – beyond the spacing between the wheels, were there any substantive differences? I’m actually kinda keen to tackle this as a scratch-building project, despite giving my friend David Woodhead some sass about his “complex” remark. Trevor, the D&RGW prototype (OU) was built in 1923, and generally is a SG model on NG trucks. OU had three (or four) distinct phases or versions with various modifications. I suspect the as-built version most closely resembles what you are after. Check out the PBL website for images. It would be worth a query to someone with a model to compare some dimensions with your Overland HO model. If the Sn3 model is not your cup of tea to start, than the Rio Grande Models parts are the next best thing. Eric Bracher has written at least one article in the NG&SL Gazette, and Jerry Day authored a book on D&RGW maintenance equipment. These are the two authoritative sources. Plus, it is a good excuse to visit Chama to see the real albeit modernized thing. If you ever actually worked one on a prototype RR you would not be happy to have one to remember the agony of operating them. Boulders break the boom and or cylinders, Cannot operate with only one side clearing ditches, as it will derail. Buried things, cables etc. are found making the Signal Dept. unhappy. I can’t help but like them. They were incredibly versatile machines – and unlike my snow plough, I can actually justify running one in the summer to Port Rowan. Without using your blog to write the complete roster and history on the CNR’s Jordan fleet, I can share with you and your followers the following info: CNR or its predecessors purchased a handful of Jordan spreader / ditchers on an almost annual basis from ( 1910 – 1914 ), ( 1918 – 1923 ), ( 1926 – 1929 ), ( 1937 – 1950 / minus WW II years ), ( 1952 – 1960 ), 1971 – 1973 ). 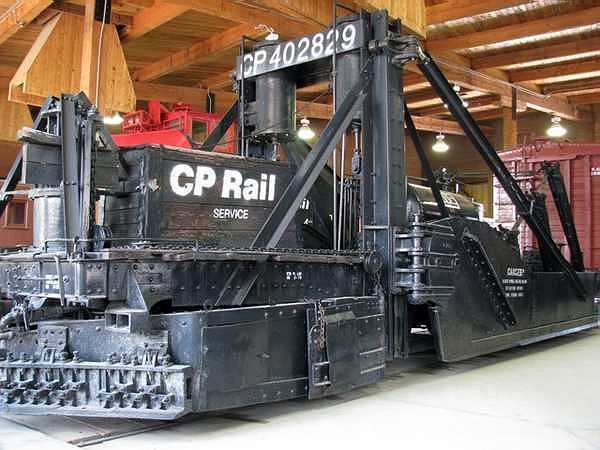 The CNR rostered 4 different models including Type ” A ” both with and without a raised operators platform, Model 1 – 150, Model 2 – 180, and Model 2 – 200. When prototype railroads purchased Jordans, they could specify certain features, including the configuration of the wings. Note that the wings on your HO model, do not show a hinged or pivoting joint half way down the blade…..so this would be referred to a ” Straight Spreader “. A blade with a hinged or pivoting joint would be referred to as a ” Spreader – Ditcher ” with the wings ( Blades ) being configurable to the profile of a ditch. The result of this wing feature, is that all Jordans were spreaders, but not all Jordans could profile a ditch! There were other models of Jordans, that the CNR never purchased, and various modifications that they did in house, specifically with regards to installing hydraulics, making identification of specific Jordans a challenging task! From my roster info, I can tell you that the linked CNR image of the 51040 is of Jordan serial # 409 built Feb 27, 1920, and that the cab was probably added after delivery by the CNR shop forces. Thanks for this, Dan – terrific information. Cheers! 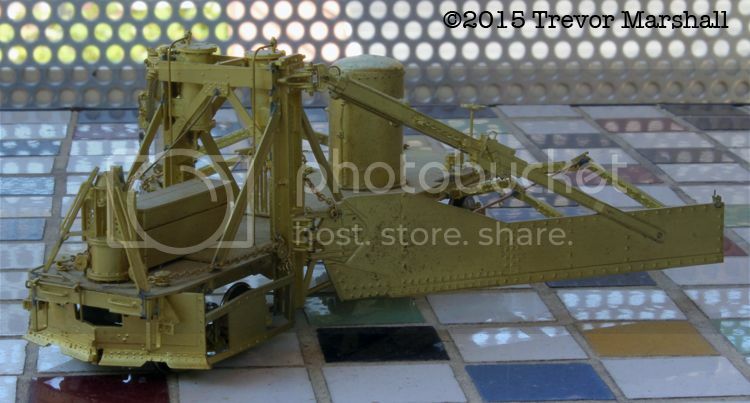 Trevor: just responding to your first reply to my post…..My info suggest that the earlier models of Jordans had a deck width of about 6 feet…..makes sense because the wings ( and support arms etc. ) in the folded / travelling position needed to be less than the more or less standard car width of 10 feet. My gut reaction is that the only major difference in some of the narrow and standard gauge prototypes dimensions was the trucks themselves i.e. taller ride height from possibly larger wheels, longer wheelbase trucks, and of course the wheels and side-frames riding 10″ or so further out each side! Note in your linked PBL pictures, the hinged joint on the ” Ditcher ” style wings! I’ll bring a small package of info on the subject for you to the CAN-AM meet…..only a few weeks away, and I can’t wait! Sure would be a fun scratch-building project! That looks like a fun project. I’m currently in the process of building a styrene model of a GN Snow Dozer (http://www.rrpicturearchives.net/showPicture.aspx?id=2302414) in order to build a working model out of brass. I mention this because I have some detailed drawings of the side wings, and the assorted pulleys, chain and air reservoir system. Although it wouldn’t be an exact match to you model, it might give you some more information to construction methods. If your interested, let me know and I can share them with you. Thanks for the encouragement and ideas, everyone. 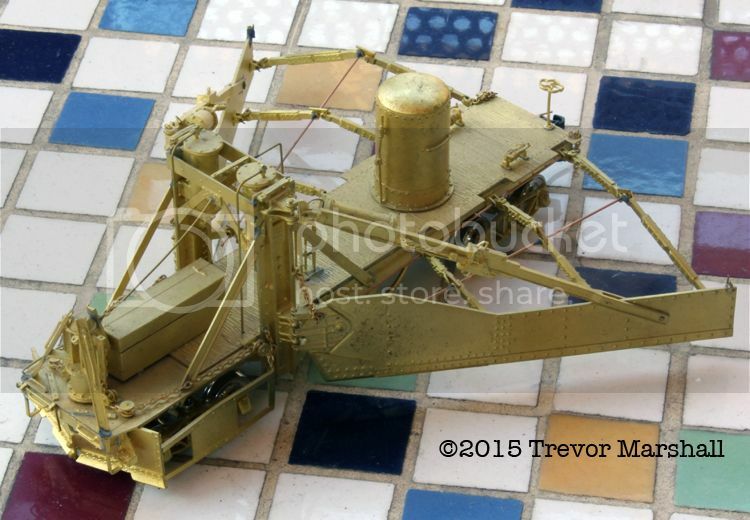 I’m particularly interested in the Rio Grande Models parts – I’ll have to look into those. At first glance, they don’t appear appropriate for my model, but at least I know they’re out there and it may be worth picking up a kit for OV, just to see.